Author: Richard Smith, Tim Hartz and Ryan Hayes Vegetable Crops and Weed Science Farm Advisor, Extension Vegetable Specialist and USDA Lettuce Breeder, respectively. Tipburn of lettuce is a calcium-related disorder which causes the development of necrotic areas on the inner leaves of romaine and other leaf lettuce and on enclosed leaves of head lettuce (Photo 1). The necrotic areas likely develop due to a localized calcium deficiency that causes tissue collapse of the affected cells. There are two key factors that affect the development of localized calcium deficiency: 1) uptake of adequate calcium from the soil, and 2) calcium transport through the plant. In a study conducted from 2005-2006 Tim Hartz, Michael Cahn and I showed that soil calcium levels in the lettuce growing areas of the Central Coast were optimal for plant growth. Soil calcium levels as measured in saturate paste extract was found to be the best indication of available soil calcium to the plant. The reason for this is that soil calcium levels from saturated paste extracts can be easily converted to concentration of calcium in the soil water, as well as pounds of calcium per acre in the soil water. In the two-year survey of a number of soils in the Salinas and Central Valleys, calcium concentrations in the soil water were found to average about 680 ppm; this value exceeds the calcium levels that are used in hydroponic vegetable production systems (100 – 200 ppm). Only one sandy soil in the survey had calcium levels below 200 ppm. In the study, the effect of supplementing soil calcium with calcium thiosulfate, calcium nitrate and calcium chloride through the drip system was evaluated. Calcium from these materials was applied at the rate of 10-15 pounds per acre. No impact on tipburn symptoms was observed in these trials. To understand why this occurred, it is important to compare the amount of calcium that was applied to what was already in the soil. Calcium levels in the soil water can be converted to pounds of available calcium on a per acre basis; the amount of available calcium in the soil water in these evaluations was approximately 200 pounds/A, so the fertigated calcium supplied only a small fraction of what already existed in the soil. Another factor in calcium nutrition of lettuce is the effectiveness of calcium transport through the plant. Calcium moves in the xylem by transpirational flow and is delivered to all parts of the plant this way. Factors that reduce transpiration also reduce calcium availability to leaf tissue and may lead to tipburn symptoms. 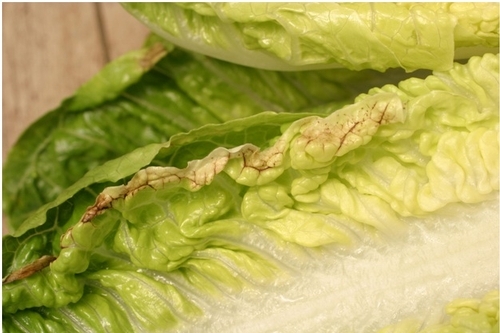 Leaves enclosed in head lettuce and inner leaves of romaine are susceptible to tipburn because they are not transpiring as readily as leaves in the open which can transpire freely. In addition, root growth of lettuce decreases approximately two weeks prior to maturity which can further limit the supply to calcium to the transpirational stream. Various aspects of the growth pattern and physiology of lettuce varieties affect their susceptibility to tipburn (Tables 1-3). In a study conducted in 2005 and 2006, Sylvie Jenni and Ryan Hayes, showed that, in general, head lettuce types are less sensitive to tipburn than romaine types. This is primarily due to greater breeding efforts on tipburn resistance dedicated to date for head lettuce types. An additional factor that influences the development of tipburn on lettuce is the weather. Foggy weather that reduces transpiration in the last 6-10 days before harvest is conducive to the development of tipburn in susceptible varieties. One practice that may have a place in reducing tipburn is the use of foliar applications of calcium prior to and/or during the critical period of lettuce development. I currently have four trials out evaluating this technique. At the recommended application rates of the materials being tested, weekly applications of 0.15 to 0.20 lbs of calcium are applied. The trials are currently underway, but the question will be, can we get enough calcium into the plant at the right time? In addition, can the spray reach the tissue that may develop the symptoms, given that calcium does not readily move in the phloem of the plant? Conclusions: Lettuce production soils of the Central Coast generally have high levels of readily available calcium. Most coastal soils have well over 200 ppm of calcium in the soil water which is adequate for optimal plant growth. The greater issue for the development of tipburn in lettuce is the variety. In addition, persistent foggy conditions that reduce transpirational flow of calcium to all parts of the leaves in the last 6-10 days prior to harvest will trigger this disorder in sensitive varieties. Photo 1. Tipburn symptoms along the edge of an inner leaf or romaine lettuce. Table 1. Head Lettuce: percent of plants with tipburn tested in Salinas, California and Yuma, Arizona (adapted from Jenni and Hayes, 2010). Table 2. Romaine: percent of plants with tipburn tested in Salinas, California and Yuma, Arizona (adapted from Jenni and Hayes, 2010). Table 3. Leaf Lettuce: percent of plants with tipburn tested in Salinas, California and Yuma, Arizona (adapted from Jenni and Hayes, 2010).